Any type of tree house rules. Throw a shanty on a tree trunk and the world immediately becomes a beautiful place. 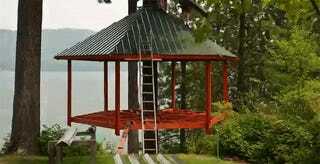 This tree house, though? This tree house is legitimately awesome. In the woods and next to the water, it has a bridge, windows, a deck, and basically everything you ever wanted in a tree house. You can watch the entire build out in the video below. I’d pay a good amount of rent to live there.